Do you want to get involved? Each year the SWP offers dozens of opportunities for volunteers to get involved in local conservation, monitoring or education projects. 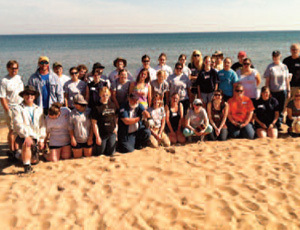 These include everything from dune restoration to invasive plant removal, taking kids on field trips or restoring important fish habitat, monitoring streams or helping at a community waste collection event. Contact the SWP office for more information. Click here to see the interactive Shoreviewer site. Or Get the FREE Great Lakes Shoreviewer App (2011). The mission of the Superior Watershed Partnership is to protect and improve the natural resources of the Upper Peninsula of Michigan on a watershed basis; by promoting responsible individual and community actions that ensure a sustainable environment, encourage a sustainable economy and help improve quality of life.